The industry has changed dramatically since my first book, Making Money in the Fitness Business was first released in 1999. Since that era, the big box mainstream gym have faded and the trainer, and the training-centric business model, has risen to dominate the field. 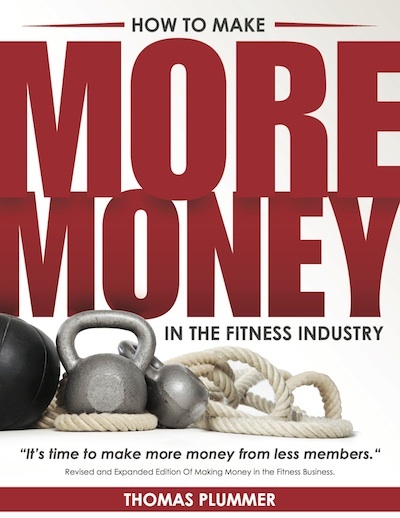 This new revision, titled How to Make More Money in the Fitness Industry, represents our entire business system used by gyms in over 30 countries around the world. The original book was a combination of a true labor of love and true arrogance. Everything I thought I knew was in that book and it represented to me a giant step forward from the past failures of the fitness industry toward a system where a dedicated owner could learn to make money ethically and professionally without hurting or failing the client. The original book sold about 100,000 copies, which surpassed all my other books combined. It is, however, time to move ahead. The book simply had to be revised to represent the market today and how business is done today. The revised book, which will be published the first week of March by Healthy Learning and Jim Petersen and his dedicated staff, covers over 400 pages of how to get it done in today’s market. Very little of the original book exists and it is a revision only in theory. The first seven chapters are new with current information you can use to make money today in a tough and competitive fitness market. The following is the introduction from the new book, which gives you a taste of what changed and why. The new version will be on sale through Healthy Learning, Amazon and through the National Fitness Business Alliance (www.thenfba.com) around March 10. I hope you enjoy this book as much as I did writing it. When this book was first written back in 1999, it represented everything I really knew about fitness at the time. When I first started in the industry, much of what we did was really all about the owner and little if anything to do with the client. Sales techniques were predatory, the equipment was worthless, few people working in the industry at the time really knew anything about fitness, getting results for clients and the national image of what we did was horrible. There were still pockets of knowledge out there that resided in the small physical physique gyms scattered around the country, but the few who understood fitness were buried beneath the hundreds that wanted to exploit the member for everything he owned. I grew up in fitness in the era of high-pressured sales. We lived, breathed and failed by learning to sell. The national chains at the time were nothing but repositories of old sales guys who could slam down a dozen a day and then do it again tomorrow. No one thought about, or cared about, the client, who quickly failed in this system and left. Why care? In those days, the member was easily replaceable and the competition was light. Sell, sell and sell again. This is a system that I learned to hate quickly. The clients then, as they do now, suffered from being overweight, out of shape and miserable in their personal lives and were looking for us to help them achieve a new level of success. We didn’t have the tools, but there were a few of us that tried anyway. Books were scarce and the ones you could find were based upon personal experience and ideas with no research or real information to back up the claims and techniques in the books or magazines. The best thing about this old information was that it predated the bodybuilders. Almost everything you read in those days, which was the late 70s and early 80s, was based upon a holistic, full body approach to fitness. You lifted heavy a couple days a week and put a lot of heavy metal up over you head as often as you could. You lifted heavy, lifted often, worked your full body and amazingly it worked for our clients. At about this same period of time fitness changed and changed for the worse. The 80s was a decade of fixed plane equipment and the first generation of workout people who chased isolation for the muscle. The emergence of the national chains and the end of anyone getting any help unless you paid a trainer to work you out six days a week. This was the advent of the bodybuilder, which for better and worse chartered a course for the industry that lasted until just the last few years. We went for show in those days and bigger the better, but we created a generation of false expectations and worthless training knowledge that still permeates the mindset even today. My absolute distaste for the early fitness industry still burns my lips today. We lied to the client to get him into the gym and then failed him once he was there. We chased image over health and failed to do any research that would have advanced the industry by several decades. The industry was for all practical purposes saved at the turn of this new century by the rise of the functional training mindset and by solid research that pointed the way. Some of the early functional pioneers, such as Vern Gambetta, Gary Gray, Jim Petersen, Cedric Bryant, Mike Clark, Al Vermeil and a few others set the tone for a new generation of trainers and training information. This first wave led to the second and the gurus of change who set the world on fire, such as Mark Verstegen, Gray Cook, Mike Boyle, Dan John, and Carlos Santana then led again to today’s best, such as Alwyn and Rachael Cosgrove, Todd Durkin, Greg Rose and Pavel Tsatsouline, who have combined to create a new generation of educated professionals that are quickly changing every concept we ever thought to be true in the industry. For once, we had tools that worked and that were validated by educated people who could and would test all the nonsense we had carried for over five decades. My mission then, as it still is today, was to change the fitness industry from an image of nasty sales techniques and failed information to one where the client got what he paid for and could trust the gym and the owner he chose to help him fulfill his goals. One workshop, one gym at a time, one owner until the consumer could look at what we did and trust us instead of fearing us as he did back in the day of the pressured sale in an office. Writing this first book was a labor of love. It was my chance to spread the word that you could make money in this business and you could do it ethically and professionally and not at the expense of hurting the people who trusted you with their money. There were later books in this long series on the business of fitness, but each new title was only added after I felt I had something new to say and while I enjoyed the writing process in each and every one, this first one was always my baby that started it all. At the time this book was written, it seemed so fresh and needed in the industry, but as with everything in the fitness world, time diminishes returns and what was once at the edge of the field and pushing beyond any accepted boundary at the time, became dated and no longer the source of vital information that could help an owner understand and master the business side of the fitness industry. My entire life has been spent going forward. I like living in the “now” and as I have told thousands of clients, you can’t change your past and the mistakes you have made so let’s talk about today and what you are going to differently starting tomorrow. Looking backward has never been productive for me, and nor for you, and once something is done in my life I let it be and keep moving towards tomorrow. Being an author, however, is a little like having your own personal time machine; just one call from my publisher, Jim Petersen, who said, “This book is getting dated. How about doing a revised edition?” led to me firing up the time machine and heading back to 1999. Once a book is finished there is no going back for me and I truthfully haven’t looked through the first edition of this book more than a handful of times in the 14 years since I wrote it. Picking it up again left me with two impressions. First of all, the material was right for the decade it was written, but it is not very close to how an owner has to think or work to be successful in a market that has changed so dramatically in so few years. Secondly, I was pleasantly surprised that there were still some fundamental truths in the book that have endured over time. For instance, building a receivable base is still a fundamental rule that can’t be changed even today, short-term debt still can kill a business and customer service still is an essential. The failings of the original book today, however, were glaring. When this book was first published, there were no low-priced gyms, no training gyms that mattered, trainers were at best clipboard cowboys, and the chains that ruled that era have since faded to almost oblivion. Most importantly, back in the day in 1999, competition in most markets was at best moderate, meaning that most gyms could safely operate with little or no competition and the tools of the years that preceded 1999 going back to the 1950s, the era when the gym business started to first rise, were still somewhat valid. In 1999, gym owners were still pressuring sales in offices, still just selling access to equipment through an inexpensive membership, and still using price-driven marketing to get leads. All of these concepts, by the way, have totally failed in today’s market including the idea that you can be the lowest bidder in the market and simply rent equipment to a consumer who will be gone in a few months. There is an important rule in the fitness business that no one recognizes, but most everyone is affected by at some time or another. This rule is the 10-year rule and it states that few concepts in fitness will be sustainable for a 10-year period. Every new idea in fitness has pretty much the same curve of growth, but you as the creator or eventual leader get to choose your own ending. For example, in the 1980s aerobics started a long, slow growth period, got hot and rose to the pinnacle of need, quickly declined in the early 90s and then completely disappeared for about a decade. This pattern is true of most concepts in the fitness industry, and it is why you constantly need to look at what you own and what you’re doing and reinvent. This is why consultants who write books need to go back and question every concept in their older books and ask if that idea is still relevant and would it work today? We see the this pattern of long, slow grow, followed by a hot, “must-have-it-now” pattern, the quick decline and then oblivion in everything we do and in the real world too. Starbucks stumbled until its founder stepped back in and reinvented the company. Apple stumbled until Steve Jobs came back and set it again on its original course and only the future knows if that company can continue to amaze after the death of Jobs. Great companies in the industry, such as Gold’s Gym and World’s, were the rulers of their decades, yet the companies sold and somewhat faded from their once true glory. Gold’s Gym was probably the most recognizable fitness name on the planet for several decades, but again, it is a lot easier to get to be number one than stay number one over time. Can these great names be reinvented by their current management and follow the path of Starbucks or will they fade and become just another former success story in the history of the industry? The difference between long-term sustainable success and oblivion is evolution. Howard Schultz let Starbucks evolve, but only by remaining true to its roots. This sounds contradictory, but under his second generation direction, the company changed to meet the needs of its continually evolving customer base while never forgetting that it was, and always will be, about the coffee and the experience. In the fitness business, creators of new concepts tend to sit on the past and cling to original methods and ideas. This list is long, but how many chains and franchises have you seen rise, become hot, and then fade away over a decade or so because the consumer and market simply grew past the original concept. Curves was a brilliant idea at the time, but a decade or two later and the concept became archaic and a hard sell in the market as the total number of units they operated continued to decline for a number of years. Their method of training, based upon a simple circuit concept, was right at the time when it was founded, but compared to the advent of functional training and how the proven methods of training, even for the older woman, has evolved can this business model be sustained into the future? Everything has to evolve or it dies and businesses, even wildly successful ones such as the original Curves franchise model, eventually reach a stage where you grow or fade. When this introduction was written there were a number of other companies that were nearing that vital period where either they evolved into next generation or begin the long slow march to obscurity. Once you reach that pinnacle position of being really hot after the long, slow build, how long can you truly stay hot? There is another position between hot and the big fall and that is where you operate as a long-term dependable company that keeps its product fresh, service great and always is moving itself ahead. Starbucks is over 40 years old, but its stores and concepts seem fresh and as if it was a brand new company. Sears is in the fight now to remain relevant. Montgomery Wards disappeared. Almost all of the Curves imitators failed and disappeared. Reinvention is life and whether you grow or you die in the fitness world is driven by your response to the rapid pace of increasing knowledge, better educated employees, such as the trainers and a much more sophisticated client who all are pushing the gym owner to grow and adapt or face being ignored and fail. It will be interesting in the near future to see if companies such as CrossFit, Planet Fitness, Les Mills, Gold’s, LA Fitness and the rest of the current big names, or programming giants such as Zumba, will continue to evolve and stay relevant or become a victim of the 10-year rule and start that quick slide to where they are rarely discussed and are no longer relevant in the business world of fitness. Obviously, the first edition of this book was a victim of the 10-year rule and needed reinvention to stay relevant for a next generation of fitness business owners. The business model I have advocated all these years, and that has been quite successful for thousands of owners, needed to be tweaked, a process we started almost a decade ago. This book now represents all that we know today about running a successful gym as well as validating some of the original concepts that were slightly ahead of the curve. One of the basic tenets I have always believed in is that going for heavy volume, meaning chasing an endless supply of new clients each month to replace the ones you burned up was not sustainable over time. The concept was right, but it was wrong in that it was introduced too early in the market. Going after a higher-return-client-served was the right idea, but it was hard to sell in the industry when the volume guys were still writing the big sales. In other words, it was the right idea, but we didn’t have the tools we needed to get it done back in 1999. But that has changed, and now is the time to recognize this principle. And most importantly, owners are listening now because of all the things that have failed in the last 20 years, nothing is more earth shattering than the failure of the volume based business model. The missing ingredient all these years was the training component of the business. It seems absurd now, but working people out for money has been a small part of the industry for over 60 years. We have done nothing since the inception of the industry over 65 years ago, no matter how this is argued, except sell a membership to a person who pays each month to a gym so he can access, or in other words rent, the gym’s equipment. The statistic that validates this has been constant for several decades. In a typical, mainstream fitness center, whether independent or chain, only about 5 percent of the membership work with a trainer on a regular schedule on an annual basis. If you are math challenged, look at it this way; in this gym, 95 percent of the membership gets no help whatsoever and practice some form of do-it-yourself fitness usually regulated to going around a circuit of set equipment that has been proven a hundred different ways not to get the person into shape over time. The evolutionary key, and the premise behind the revision of this book, is that the industry cannot last as a rental company for equipment, even at $10 per month. We have to move from a volume approach, where the member is expendable and irrelevant over time, to a training-centric business model where we have to chase the maximum results, for the maximum number of clients, in the shortest period of time, and keep our clients for as long as we can in a hyper-competitive market place. This revision contains our complete business model to make this happen for you and your business and it doesn’t matter if you own a big box mainstream gym or small training gym on the corner. Everything you need to be financially successful for the coming decades is here, proven by thousands of clients over a 30-year period. We now have the tools, we now have the education, and for the first time, we now have the clients willing to support a system designed to help them succeed. There is one thing you have to understand if you want to make the fitness business your life’s work. We exist to change lives. We exist to help people who struggle with health and fitness get better. We exist to make a difference in our communities and with the people who trust us with their money. We can do all of this and still make more than enough money to take care of our lives and our families. If you are in fitness because you want to make a difference, then this book is for you. Tags: #businessoffitness, #fitfam, #makingmoney, #savingtheworldonehealthclubatatime, #thenfba, #thomasplummer | Permalink.